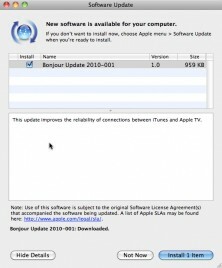 Apple has released Bonjour Update 2010-001. 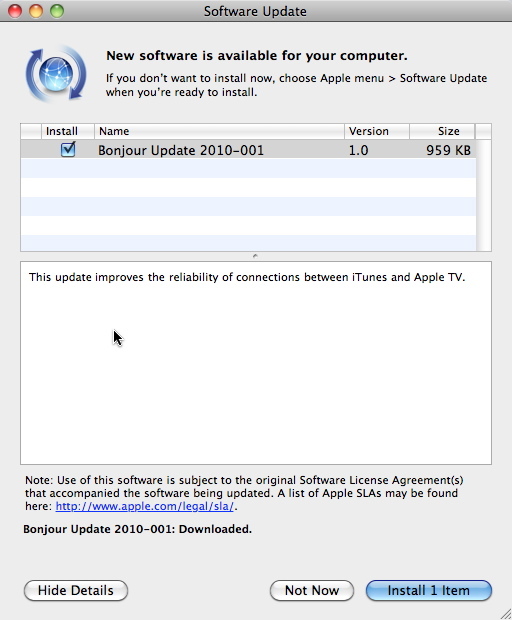 The update addresses problems with “iTunes and Apple TV connectivity”. Bonjour is a service discovery protocol designed to easily connect devices in a network. The update is available from the Apple Software Update Utility. Apple Remote Desktop was also updated. Apple released Remote Desktop Client 3.3.2 and Remote Desktop Admin 3.3.2. Both updates “addresses several issues related to overall reliability, usability and compatibility”. Apple Remote Desktop is the Mac OS X remote management application. Via The Mac Observer. Finally, Apple’s Logic Pro and MainStage were updated to support 64-bit. More details on Apple’s site: Logic Pro 9.1 and MainStage 2.1. Via The Loop. Previous: Having Problems with iPhone Push feature?